Adai (அடை) is a traditional pancake made of rice, lentils and spices. Adai is made for breakfast, or for dinner on specific days. In the traditional Brahmin household, adai is prepared often, mainly to increase the protein content of the diet. Adai is a crispy, tasty and heavy breakfast item. Children enjoy when adai is served with ghee and jaggery. Adai and aviyal make a famous combination! Note: The quantity mentioned here makes approximately 12 adai. 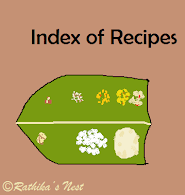 However, the number of adai depends on the tava you use and the size of the adai you make. How to prepare the batter: Wash par-boiled rice, urad dhal, Bengal gram dhal and toor dhal, and soak them in sufficient water for 4-5 hours. Grind soaked items with salt, asafoetida, red chillies and required water using a wet grinder or a mixer-grinder into a smooth paste. Transfer the batter into a container. Add water, if required, to make the batter into pouring consistency. Add curry leaves and mix well. You can make adai immediately. You may refrigerate the batter and use it to make adai as needed. How to prepare Adai: Traditionally adai is made using ‘Adai Tava’ (அடைக்கல்) which is a round griddle, slightly hollow at the center. It is made of cast iron or aluminium, with or without a handle. Mix the batter well before using. Heat the tava on medium flame. Once ready, spread the batter evenly on the tava. Adai is generally made thicker than the dosa. Hence, do not spread the batter too thin. Make a small hole in the center of the spread batter using a spoon. Add oil around the adai and in the central hole. Allow it to cook for a minute. You will find the edges of the adai start to become golden brown. Turn the adai over and cook for short while. Remove from the tava and serve hot with chutney. Traditionally adai is served with butter or ghee and jaggery. Place a teaspoon of butter on the hot adai and serve it with jaggery. Alternatively you may spread ghee on the hot adai before serving. Adai and aviyal make an excellent combination. Click here for aviyal recipe. Note: You may add chopped onions, chopped amaranth (அரைக்கீரை), grated yellow pumpkin (பரங்கிக்காய்) or chopped plantain flower (வாழைப்பூ) to adai batter, mix well and prepare adai. Use any one of these items. Chop amaranth, wash 2-3 times with water, drain fully and then add to the batter. Click here to find “how to clean plantain flower”.